WHAT IS IT? The Model FA is a multi-bladed spring arm cleaner that provides the ability for each blade to work independently of each other in order to remove carryback from a conveyor belt and deposit it into the discharge stream. The conveyor belt cleaner is available in a wide variety of blade materials. WHY IS IT NECESSARY? The Model FA is an inexpensive way to reduce material from clinging to the conveyor belt and building up on idlers and pulleys. The independent blade arrangement does not damage mechanical belt splices. Sample model is FA-(belt width)(blade type), example FA-36S. Variety of blades to chose from including heat treated spring steel (H), rubber (R), urethane (U), stainless steel (S), nickel alloy coated (N), ceramic (C), and tungsten carbide (T). The unit is mounted on the conveyor by drilling (4) 9/16" diameter holes. Single pressure handle adjustment provides blade tension against the conveyor belt. Individual spring arms provide additional tension. 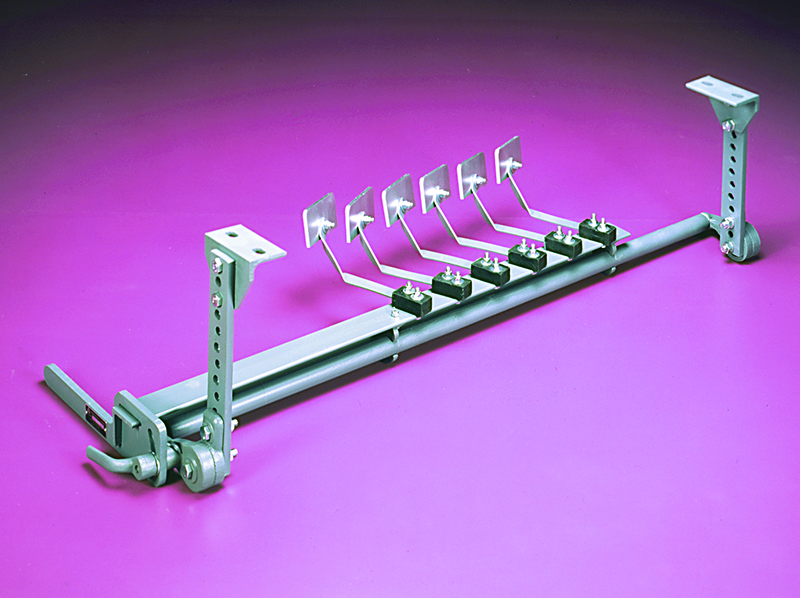 Hanger rail mounting is standard, flange mounting or chute mounting also available.